This .357 SIG ammunition delivers effective self-defense for owners of P229s, Glock 31s, and other pistols chambered for this powerful cartridge. 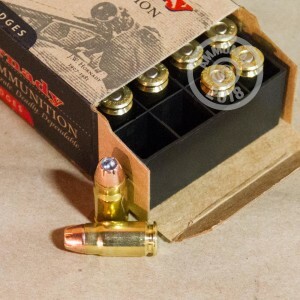 Each round in this box of 20 fires a heavy 147 grain XTP jacketed hollow point at 1,225 feet per second. 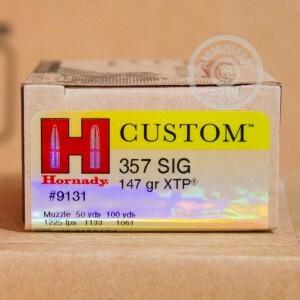 The XTP bullet is one of Hornady's own designs and is known for its strong penetration and reliable expansion. 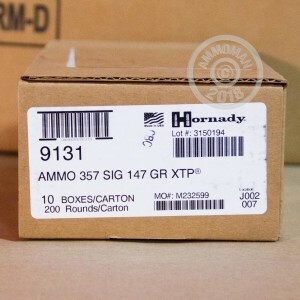 This ammo is manufactured in Grand Island, Nebraska using non-corrosive Boxer primers and brass cases.